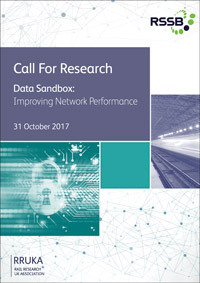 In October 2017, RSSB launched a £500,000 call for research for feasibility studies to identify data driven solutions to key network performance challenges. On this page you can find information about the research competition and watch footage from the information day. Data and Performance: how do they fit in the Rail Technical Strategy Capability Delivery Plan? The railway is a complex system with multiple interfaces delivered by many different organisations. At RSSB, we bring these different organisations together to make collective decisions. Through research, analysis and the understanding of risk, we help the rail industry in the areas of safety, standards, knowledge and innovation. Click here to find out more about other RSSB R&I Competitions. RSSB ran a call for research to identify data driven solutions to key network performance challenges, with a focus on managing reactionary delays and dwell time variations. Copyright © 2017 rssb.co.uk - All rights reserved.